Product prices and availability are accurate as of 2019-04-19 12:26:40 UTC and are subject to change. Any price and availability information displayed on http://www.amazon.com/ at the time of purchase will apply to the purchase of this product. DriTac 9100 Contractors Choice High Solids Wood Flooring Adhesive is a Polymeric Resin that has been formulated for wet-lay installations. DriTac 9100 Contractors Choice is a professional grade adhesive that spreads easily and cleans up with a damp rag. Installers must lay wood into the adhesive immediately after troweling the adhesive. 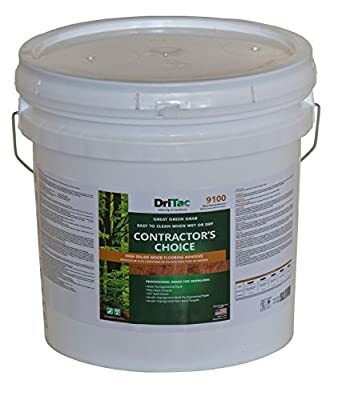 DriTac 9100 Contractors Choice has low VOC content, is fast grabbing and low in odor. It is designed for wetlay installation of multi-ply engineered plank, plain-back parquet (not foam back), 3/4" solid shorts, acrylic impregnated multi-ply engineered plank and acrylic impregnated plain-back parquet.